Back when I first started blogging years ago, it was all very simple. You only needed the basic tools: a blog and a computer/laptop. 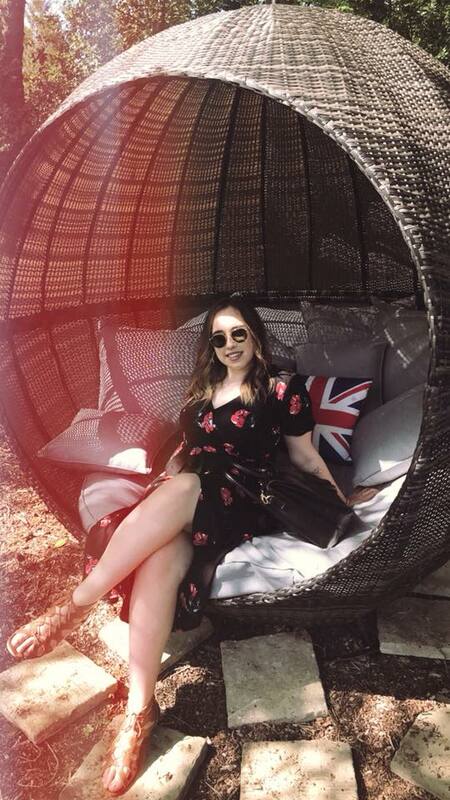 As the years go past, I am becoming a lot more serious with my blogging and I have tried many different resources and tools to help make my blog run a lot smoother and become more efficient. I wanted to share with you some of the tools that I find essential when it comes down to maintaining my blog, let’s get started. Probably one of the most obvious tools. Of course you can maintain a blog without adding any photos to it however it all seems a bit dull and unprofessional without them (in my opinion). You’re more likely to attract a bigger audience if you have photos on your site. What camera you decide to use is completely up to you, as you don’t always need a fancy DSLR when you’re first getting started. I personally use my iPhone camera for some blog pictures and I edit them on VSCO Cam. I already own a Nikon B500 camera from when I did photography in sixth form therefore sometimes I tend to use that too but just use whatever you feel comfortable with. I can’t even begin to tell you how many notebooks I own. It’s slightly ridiculous however I go through them way too quickly. Notebooks are super handy when it comes down to staying organized with your blog. I have a whole notebook dedicated to blogging ideas, then I have another one completely dedicated to my blog routine. I like to schedule my posts and check off my to-do lists on a daily basis. I have only just started scheduling my Twitter posts recently and I’m so glad I did as it makes things 100 times easier. One of the main things when it comes to blogging is promoting your posts, if you don’t promote what you write it makes your blog a lot harder to find and less people will read it. My main source of promotion is Twitter and I like using the Buffer app to schedule when my next promo tweet will go up. This is perfect for those who work full time during the day and don’t have a lot of time to spend on social media, simply schedule your posts the day before and let them automatically post on your Twitter throughout the day. If you’re like me and you check your page views via Blogger, then stop what you’re doing. After a ton of research I found out that the Blogger page views aren’t correct and they’re not a true representation of how many views you’re getting monthly. Instead, sign up to Google Analytics if you’re wanted to analyse the success of your posts. If you want to learn more about this, head over to this post HERE where Leah from Devoted to Pink shares the basics about Google Analytics and tells you how to effectively monitor your blog traffic. Everyone needs a photo editing app, and these two are my absolute favourites. Snapseed is the first one I use, mainly to get that perfect white background. If the lighting isn’t looking too great and the photos come out a bit dull then Snapseed can help you out with that. Moving onto VSCO Cam which I’m sure pretty much everyone has heard about. You can edit pretty much anything with this app and it contains a variety of FREE Instagram worthy filters. What’s not to love? 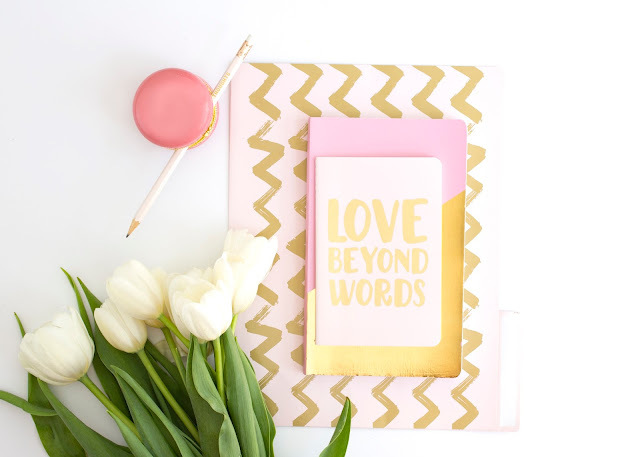 I’d love to know what blogging tools and resources you like using on a daily basis! To me, there’s nothing better than snuggling up in my PJ’s, grabbing a good cup of tea and maybe some popcorn if I feel like getting real fancy, to watch a movie. I’m an absolute movie geek and the fact that myself and the boyfriend have unlimited cinema cards is perfect for us. We legit go to the cinema around twice a week if we’re not too busy and its fab. I’m going to share with you some of the movies that I could watch over and over again without getting bored. The ones that I just can’t resist. The Notebook. Of course, most girls favourite love story and a good ol’ tear-jerker. I can be the soppiest romantic person when I want to be therefore I feel like this movie was made for people like me. The love story in this is without a doubt one of my favourites. Plus, RYAN GOSLING. Drive. Speaking of Ryan Gosling… I love him in this film. I have to be in a certain mood to watch an action/crime film and when I am, this one always comes to mind. Although I would stay away if you don’t like gore. Mean Girls. You go Glen Coco. This is the most classic chick flick to watch at a sleepover with your friends. I have seen this movie so many times that I know the whole script. Literally not even an exaggeration. No matter how many times I watch this, it still gives me endless amount of giggles. Hairspray. One of my favourite musicals. (Apart from La La Land). Hairspray is just one of those up-beat feel good musicals that I can’t help but want to dance and sing along to every single time. I’m pretty sure my boyfriend gets fed up with the amount of times I start singing ‘I can hear the bells’ out of nowhere. Harry Potter. Who doesn’t love a bit of Harry Potter? I have grown up watching it and I wouldn’t want it any other way. I’ve been through so many emotions whilst watching the films and I can’t even begin to explain how happy I was when I found out about Fantastic Beasts! Star Wars. A lot of people have been shocked when I’ve told them how much of a Star Wars geek I am. I remember watching them back to back when I was younger and a few years back, I did a Star Wars Marathon on May 4th (be with you) Get it? But no seriously, we started at 6am and finished at 9pm. It was great. Bridesmaids. One of the funniest films I have ever watched. I saw this twice at the cinema and a few times at home and it still makes me laugh to the point where my belly hurts. Ghost. I remember my mum showing me this film when I was younger, and then I remember crying my eyes out in her arms afterwards. It’s such a beautiful film. Patrick Swayze and Demi Moore do such a fantastic job in this too. The Fault in our Stars. Another one that will produce you to tears. I read the book in about 2 days, and then of course I was super excited when I heard they were making a film out of it. I saw it the first night it came out and I simply loved it, although I cried my eyes out. I think the most exciting thing ever was when I went to Amsterdam, myself and the boyfriend visited the famous bench that was in the film and we ended up putting a love lock onto it. It was a cute moment okay? Prisoners. Wow. This movie gives me way too many emotions. It’s a good 2 hours and 30 minute film however it’s literally one of my favourite crime/mystery films ever. Hugh Jackman plays an amazing role alongside Jake Gyllenhaal who is also amazing. If you’re a parent, I feel like this movie would make you feel terrified of leaving your kids alone to play outside. It terrified me and I’m not even a parent lol. I feel like I wanted to add a lot more films into this but these are the ones that I most enjoy watching. I’d love to know if you like any of these too. What are your favourites to watch over and over again? 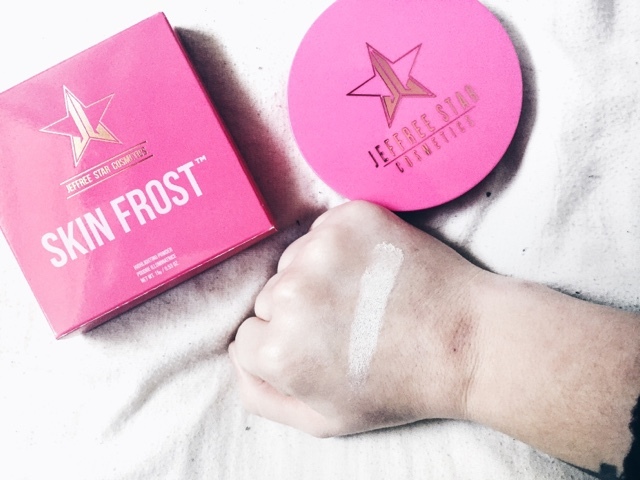 If you know me then you’d know that I am a huge fan of Jeffree Star Cosmetics, his liquid lipsticks are one of my favourites in terms of formula, pigmentation and the whole colour range. Ever since his Skin Frost collections came out last year I have had my eye on the Ice Cold shade for what seems like F O R E V E R. I was super undecided about this product as I didn’t want to spend £25.50 for a highlighter however it’s so worth it and I’m very happy that I did. When I received this product, I was surprised with how heavy and large the packaging was. 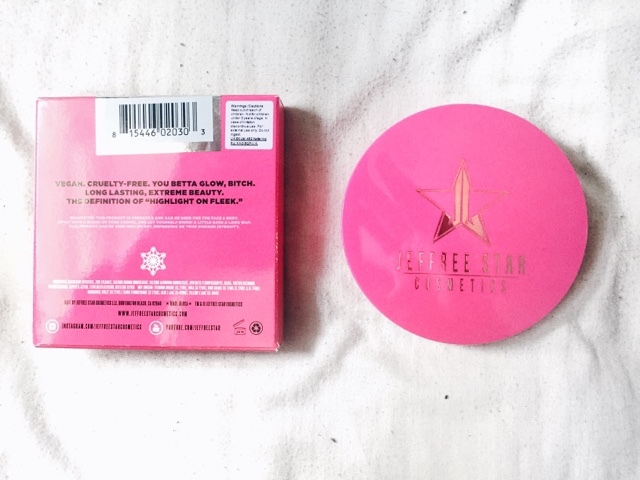 It comes in a beautiful vibrant pink plastic container with the Jeffree Star logo printed on the lid in a kind of duo-chrome colour. 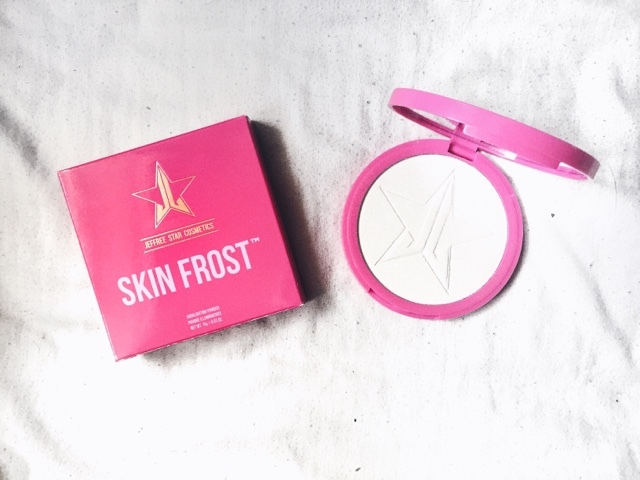 It has a generously sized mirror which you can see your whole face in making it easy to apply the highlighter. You get 15g of product in this bad boy! Which immediately makes me think I’ve got my money’s worth already considering if we compare it to Becca Shimmering Skin Perfector for example, you only get 8g of product in that for a whopping £32. In terms of the formula, it’s amazing. Just as I expected it to be. Its super pigmented and blends out beautifully on my skin as it has a buttery smooth feel to it. The formula reminds be a bit of Makeup Geek Foiled Eyeshadows as it’s has a super metallic look to it. You only need the tiniest amount of product for that beautiful glow, a little goes a very long way with this. I bought mine off of Beauty Bay where they have a wide range of 12 shades, I opted for Ice Cold as I’m more on the pale side and I find that this would work perfectly for those with a more fair skin tone. I struggled to find a highlighter that suits my pale skin until now. Did anyone else own a fan brush but never knew what it was for? I only recently discovered the wonderful world of highlighting at the beginning of last year and realised that fan brushes are the one when it comes down to highlighter. I understand that some people hate using fan brushes as they feel like it doesn’t pick up enough product however my fan brush picks up the perfect amount for an everyday glow. If you’re wanting a more dramatic highlight then I’d suggest using Morphe E30 for a more precise application too. I will most definitely be purchasing his products in the future, I actually have my eye on his Peach Goddess shade and I want to try to get my hands on the Jeffree Star and Manny MUA Collab products. Have you tried any of Jeffree’s products yet? 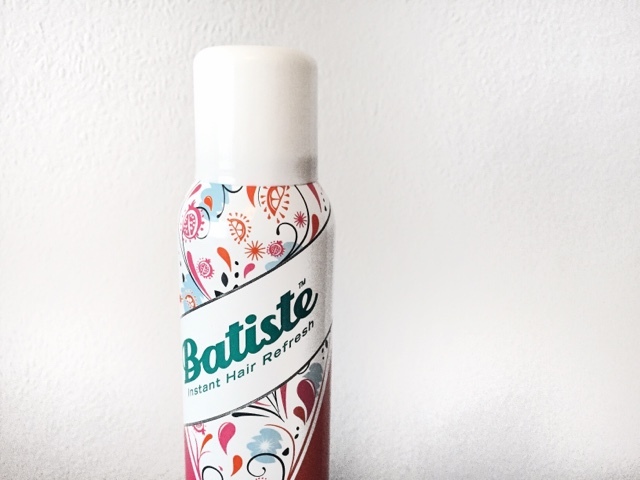 I went out on a hunt for a new dry shampoo, I wanted something a bit different as I tend to re-purchase the original Batiste dry shampoo although I’ve never liked the fact that it leaves a white cast through my hair yet it manages to make my hair feel super clean. 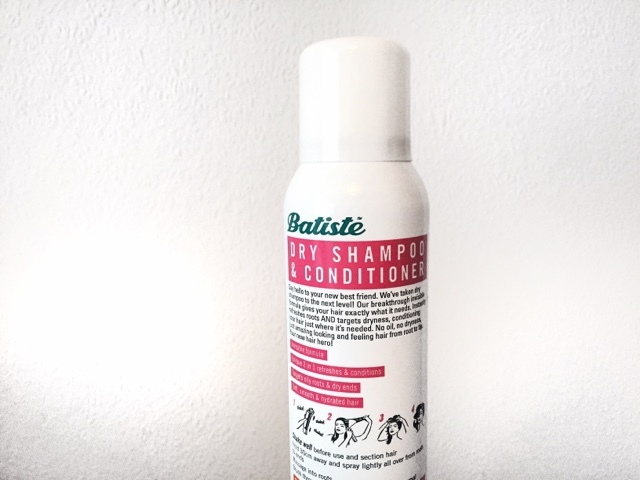 I was very intrigued when I saw the newest from Batiste with their 2 in 1 dry shampoo and conditioner. I want to start by saying that I love the scent of this. I opted for the Orange and Passion fruit as I tend to lean towards fruity and tropical scents. I believe there are 2 more flavours in this range: Vanilla and Passionflower or Cocoa and Cashmere. The one key word which interested me the most was “invisible”. Yep that’s right, the product leaves no white residue through your hair but does it actually work as well as the original Batiste when it comes down to cleaning my hair? The product claims to refresh roots and nourish the ends of your hair with their new 18 hour conditioning properties. It specifically targets dryness and conditions the areas where it’s needed. It also says that it doesn’t leave any excess oil and claims no more dryness leaving your hair smooth and hydrated. I’m quite lucky as my hair doesn’t get greasy until the 3rd/4th day, I shook the can really well beforehand and then sprayed a little amount through my roots whilst massaging it in. It left no white cast which I was really happy about however I’m not too sure as to what it did for my oily roots. Although my hair felt soft and a lot smoother than before, it made my roots look shiny and if anything, more greasier. Saying that, I prefer using it on the mid lengths and ends of my hair where it’s the most driest to give it a bit more of a healthy shine. Considering how much I love Batiste as a brand and how I have been using their products for years, I have never been let down. I am a bit disappointed in this particular product though. I don’t hate it, but it’s not the best. It doesn’t work for me and I kind of feel like I’ve wasted my money a little bit. I wouldn’t recommend this for anyone that gets greasy hair pretty quickly, I feel like this may be targeted for those who are on the dry side. For now on, I’ll most likely stick to the original Batiste. Have you tried the newest from Batiste yet? Ahh, the wonderful months of spring. Pretty flowers, nice weather, a colourful wardrobe and a time to switch around my makeup products. Even though I’m more of an autumn/winter kind of girl, I am really enjoying playing around with more subtle colour and dewy skin looks. For me personally, spring is all about the bright colour lips and the glowing base. Take a peak of the product that I will be using throughout the spring months. I always come back to this product during the warmer and brighter months. Glowy skin is a must for me as I like making my skin look as healthy as possible and this product does exactly that. It’s the ultimate skin pick me up for those days where my skin looks a bit dull and tired. You can use this in a variety of different ways: to prime, add to your foundation, use as a liquid highlighter or you can use It on the days where you don’t want to wear any makeup yet still want your skin looking radiant and at its best. I don’t like wearing heavy foundations during spring, especially if the weather is sunny. I feel like if I wear a heavy, full coverage foundation in hot weather it can start to look very cakey on me and it kind of sinks into my pores and creases around the areas where it shouldn’t. This is why I completely fell in love with Tarte Rainforest of the Sea foundation, it’s water based therefore feels super lightweight on the skin yet it still manages to cover up any blemishes due to its medium coverage (which is very buildable). I did a full review on this here if you’d like to know more. This extremely affordable blush is something I have been using every day. I normally tend to stick to matte blushes however its spring and I like to switch it up to the glowing skin. This product contains 5 different peachy pink blush shades with tiny champagne shimmer particles to give your skin that flush of colour and glow at the same time. I purposely bought this lipstick last year for the summer months and I wore it all the frickin’ time. It’s the perfect bright coral red shade which looks amazing with a neutral eye look and it suits so many skin tones. Although it’s a matte finish, it still manages to glide over the lips smoothly and doesn’t dry your lips out too much. The pigmentation on this is incredible, you get full coverage and high colour throughout one swipe. It’s truly a show stopper and my go-to lipstick for the spring time. Words can’t even begin to describe how much I love this eyeshadow palette. Not only does it smell of peaches, it also contains 18 of the most beautiful shades full of peachy pinks, corals, warm bronzes and pops of purple that will give you endless amount of options to keep your spring makeup looking fabulous. Too Faced are one of my favourite brands when it comes down to their eyeshadow palettes, the formula of the shadows are super buttery and smooth. They glide onto the lids and blend out like a dream. 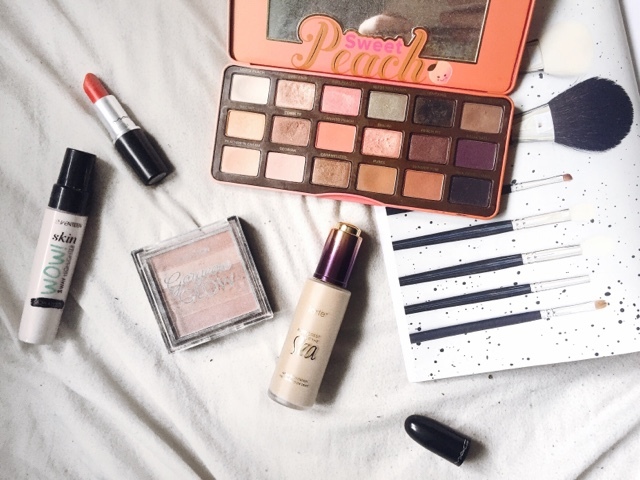 I have a post on this whole palette here if you’d like to check it out. I’d love to know what products you are using through the spring months!